Development of the infrastructure of alternative fuel stations is one of the best ways to extend the use of alternative fuel vehicles. Hence, constructing refueling stations with minimum cost is an important issue. On the other hand, considering the exact value of cost is not match with real cases. 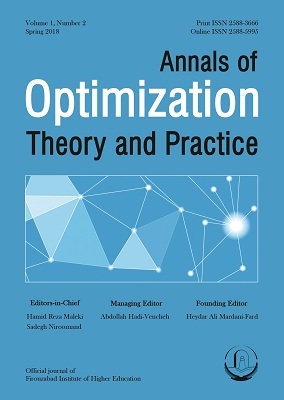 In this regard, the cost of building station is considered as a trapezoidal fuzzy value and a mathematical fuzzy programming model is presented in this paper. In order to solve the fuzzy model, first the model is converted to an interval programming model, then the equivalent bi-objective crisp model of the interval programming problem is written. Finally, two interactive fuzzy solution approaches are used to solve the respective bi-objective crisp model. The results show that the performance of the solution approaches is the same. Upchurch, C., & Kuby, M. (2010). Comparing the p-median and flow-refueling models for locating alternative-fuel stations. Journal of Transport Geography, 18(6), 750-758. Upchurch, C., Kuby, M., & Lim, S. (2009). A Model for Location of Capacitated Alternative‐Fuel Stations. Geographical Analysis, 41(1), 85-106. Ferdowsi, F., Maleki, H. R., & Niroomand, S. (2018). A credibility-based hybrid fuzzy programming approach for a bi-objective refueling alternative fuel vehicles problem under uncertainty. Journal of Intelligent & Fuzzy Systems, 34(4), 2385-2399. Ferdowsi, F., Maleki, H. R., & Rivaz, S. (2018). Air refueling tanker allocation based on a multi-objective zero-one integer programming model. Operational Research, 1-26. Alefeld, G., & Herzberger, J. (1983). Introduction to interval computation. Academic press. Selim, H., & Ozkarahan, I. (2008). A supply chain distribution network design model: an interactive fuzzy goal programming-based solution approach. The International Journal of Advanced Manufacturing Technology, 36(3-4), 401-418. He, J., Yang, H., Tang, T. Q., & Huang, H. J. (2018). An optimal charging station location model with the consideration of electric vehicle’s driving range. Transportation Research Part C: Emerging Technologies, 86, 641-654. Hodgson, M. J. (1990). A Flow‐Capturing Location‐Allocation Model. Geographical Analysis, 22(3), 270-279. Hosseini, M., MirHassani, S. A., & Hooshmand, F. (2017). Deviation-flow refueling location problem with capacitated facilities: Model and algorithm. Transportation Research Part D: Transport and Environment, 54, 269-281. Melendez, M., & Milbrandt, A. (2006). Geographically based hydrogen consumer demand and infrastructure analysis (No. NREL/TP-560-40373). National Renewable Energy Laboratory (NREL), Golden, CO..
Melendez, M., Theis, K., & Johnson, C. (2007). Lessons Learned from the Alternative Fuels Experience and How They Apply to the Development of a Hydrogen-Fueled Transportation System (No. NREL/TP-560-40753). National Renewable Energy Lab. (NREL), Golden, CO (United States). Kuby, M., & Lim, S. (2005). The flow-refueling location problem for alternative-fuel vehicles. Socio-Economic Planning Sciences, 39(2), 125-145. Kuby, M., & Lim, S. (2007). Location of alternative-fuel stations using the flow-refueling location model and dispersion of candidate sites on arcs. Networks and Spatial Economics, 7(2), 129-152. Berman, O., Larson, R. C., & Fouska, N. (1992). Optimal location of discretionary service facilities. Transportation Science, 26(3), 201-211. Grzegorzewski, P. (2002). Nearest interval approximation of a fuzzy number. Fuzzy Sets and systems, 130(3), 321-330. Church, R., & ReVelle, C. (1974, December). The maximal covering location problem. In Papers of the Regional Science Association (Vol. 32, No. 1, pp. 101-118). Springer-Verlag. Moore, R. E. (1979). Method and application of interval analysis, SLAM. Philadelphia, PA.
MirHassani, S. A., & Ebrazi, R. (2013). A flexible reformulation of the refueling station location problem. Transportation Science, 47(4), 617-628. Das, S. K., Goswami, A., & Alam, S. S. (1999). Multiobjective transportation problem with interval cost, source and destination parameters. European Journal of Operational Research, 117(1), 100-112. Sen, S., & Pal, B. B. (2015). Interval Goal Programming Approach to Multiobjective Programming Problems with Fuzzy Data Uncertainty. In Information Systems Design and Intelligent Applications (pp. 457-467). Springer, New Delhi. Chen, Y. W., Cheng, C. Y., Li, S. F., & Yu, C. H. (2018). Location optimization for multiple types of charging stations for electric scooters. Applied Soft Computing, 67, 519-528. Wang, Y. W., & Lin, C. C. (2009). Locating road-vehicle refueling stations. Transportation Research Part E: Logistics and Transportation Review, 45(5), 821-829. Wang, Y. W., & Wang, C. R. (2010). Locating passenger vehicle refueling stations. Transportation Research Part E: Logistics and Transportation Review, 46(5), 791-801. Lin, Z., Ogden, J., Fan, Y., & Chen, C. W. (2008). The fuel-travel-back approach to hydrogen station siting. International journal of hydrogen energy, 33(12), 3096-3101.